It’s Pretty Pintastic Party #54 time! I’ve been taking it outside lately and getting my grill on! Seems like all my activities have been centered around the outdoors and I wouldn’t have it any other way. Grab your sunscreen, bug spray and join me! 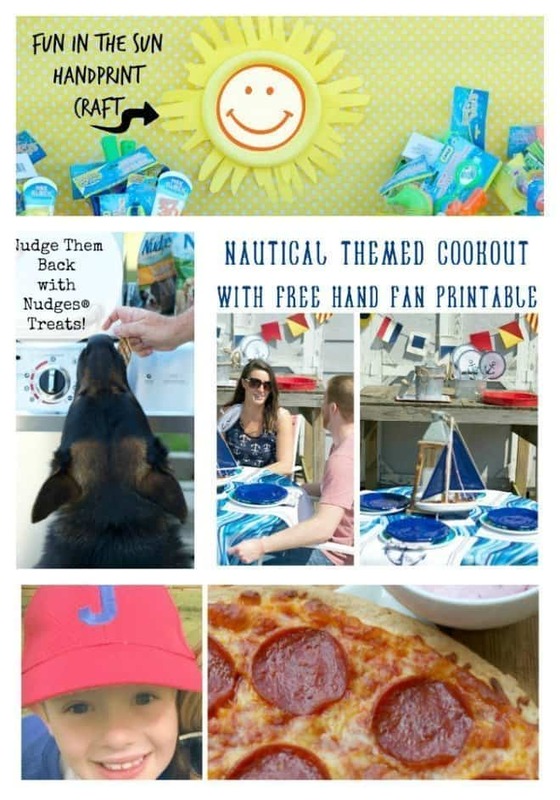 I recently hosted a great nautical themed party and included a FREE printable for a fan. Not only does my nautical fan keep me cool, but it keeps those pesky flies away! You can find it here! To celebrate the (almost) end of the school year, I had a little Fun in the Sun party for the grandkids with games and water-gun chase! I made the cutest sun using handprints. Find it here! Have you ever grilled pizza? We grilled pizza for the first time and it’s so much better on the grill! Isn’t everything? Find out how to grill pizza here! I didn’t want to leave Max, our dog, out of the celebrations, so I found some new treats for him with no artificial flavors or fillers. They even have grill marks and meat is the #1 ingredient! Click here to check it out and see pics of Max! Important: This week, we were sad to have to pass over a few posts that we thought would make great features…. but when we checked to see if the bloggers had pinned the features, they hadn’t, so we had to choose different features (we check not only the repins, but also pins from that blogger’s feed). Every week we will have a fabulous co-host! Our co-host this week is Melissa from Not Your Ordinary Psychic Mom. She blogs about parenting, children books, & family friendly recipes. Melissa recently posted 17 Summer Outdoor Activities for the Family. It has some great ideas! Show her some love by following on Pinterest, Facebook, and/or Twitter. If you would like to co-host please fill out this form! This week’s Features: Chicken Marengo from Scrumptilicious 4 You How to Save Money on Groceries Without Coupons from Keeping Life Sane Easy Crescent Rolls from Joybee, What’s for Dinner? DIY Anchor Pallet Artwork from Mia Bella Passion Shish Kebabs from Culinary Ginger Easy Ranch Cheesy Bread from The Seasoned Mom If you were featured, grab a featured button!! By linking up, you give anniesnoms.com, mommylikewhoa.com, simplicityrelished.com, wetherillssayido.com, mandablogsabout.net, thetiptoefairy.com, coffeewithus3.com, gloriouslymade.com, anallievent.com, sarahsofiaproductions.com, recipesforourdailybread.com, ouramericantravels.com, suburbanwifecitylife.com, dandeliondiscoveries.com, divasrunforbling.com, seekinglavenderlane.com, thetakeactionwahm.com, or any co-host permission to feature your post on social media and our blogs using a photo, title, and link to your site. Proper credit and links will be given to you. Thanks again for a great party. So many great posts each week.